If you suffer from seasonal allergies and worry about Zyrtec side effects, it may help to understand what you’re up against when making a decision about using it. Seasonal allergies can drag you down and keep you indoors when the weather is nice. Making a decision to treat allergies comes down to finding the best medication that works best for you. This article outlines some of the side-effects you may experience with Zyrtec and how they may impact your treatment. There is also helpful information on how Zyrtec is used, its effectiveness, and some alternatives to help with your decision. What's Zyrtec Use for? How Does It Work? Zyrtec is a medication used to treat seasonal allergies and allergies to certain foods or substances. Some people use it year round for environmental or food allergies, while others may only use it during certain times of the year when certain pollens are at high levels in the air. Zyrtec works by inhibiting histamines in the body. Your body produces histamines in response to foreign substances that enter your body. Histamines are released and cause the symptoms of allergies including runny nose, watery eyes, rashes and eczema, coughing, wheezing, and sometimes low-grade fevers. Zyrtec is a once daily medication that you take at the same time every day. It comes in two different strengths for children and adults, either 5mg or 10mg. For small children, there is a prescription strength that is dosed by weight. Zyrtec should not be used more than once daily and you need to follow your doctor’s instructions and the package instructions. If you are unsure how to use Zyrtec, call your doctor. Never use more or less zyrtec than what is indicated by your doctor or on the package. 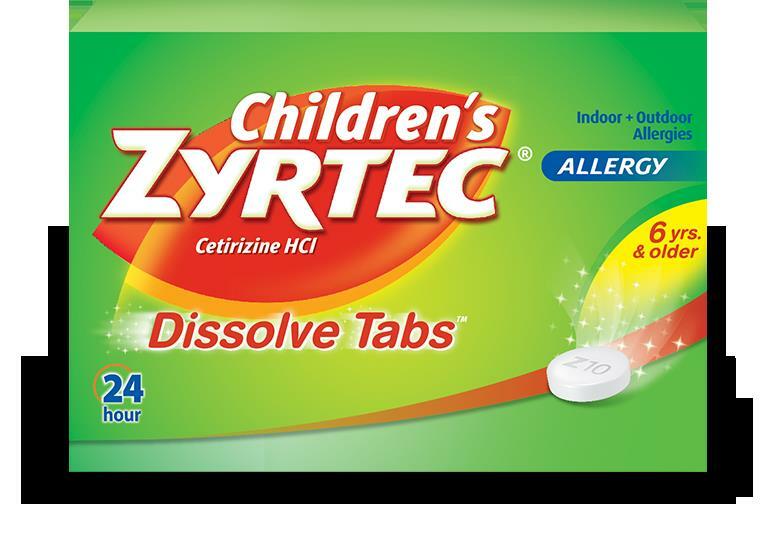 Zyrtec does not need to be taken with food, and the chewable tablets need to be chewed thoroughly prior to swallowing. If you are using the dissolvable tablets, do not chew or swallow whole. Allow them to dissolve slowly until they are gone. After tablets are dissolved you may sip some water. Side effects of Zyrtec fall into two categories: mild and severe. If you have mild side-effects, it is usually nothing to worry about. If they persist, you should call your doctor and let him or her know. If you have signs of an allergic reaction, call 9-1-1 or get to the emergency room right away. If you are experiencing allergy symptoms for the first time, you should get checked by your doctor to make sure you are not suffering from an upper respiratory virus or bacterial infection. Your doctor will make a recommendation at that time if they think Zyrtec will be helpful. See your doctor if you are taking Zyrtec and it is not helping your allergy symptoms. You may need a medication change and your doctor can best recommend what to do. You should also contact your doctor if you are experiencing mild side-effects that do not go away, or moderate side-effects. Severe side-effects need immediate medical attention. Some seasonal allergy sufferers find relief with steroid nasal sprays. These are taken twice daily, but take about two weeks to become effective. They have fewer side-effects, but can cause yeast infections in the mouth and nose, nosebleeds, and funny taste in the mouth. Benadryl is an option for fast relief, especially for food allergy sufferers. However, it causes drowsiness and should not be used during driving, working with machinery, and in very small children. Fast acting antihistamines tend to work better when used only when needed. After skin allergy testing, an allergist makes up a serum with the proteins of things you are allergic to. This is given by injection in very tiny amounts to help your body produce antibodies to the substance instead of histamines. This requires going into the allergist's office on a regular basis to receive the injection. For some allergies, you may not take anything at all until the reaction happens. In the case of life threatening allergies like peanuts, bee stings, or shellfish exposure you need to carry an "epi-pen" to rescue yourself as soon as the exposure occurs. Some people have such a strong immune system response to allergens that they may need to go on a short course of oral steroids to calm the initial reaction. They often need to do this once or twice a year at the start of high allergy seasons. This is most common in people with asthma or other respiratory issues. NOTE: Sometimes the benefits outweigh the Zyrtec side effects because of severe seasonal allergies and you may have to stick to the prescription.